Effortlessly wipes on and off the average size vehicle in under 30 minutes. No hazing, streaks, smears or dust – even in direct sunlight. Used day in and day out by countless Auto Dealerships, Professional Detailers, Body Shops, Auto Auctions, Professional Race Teams, Auto Museums, and the most discriminating classic car owners. Wiping this wax on an average size car only takes about 15 minutes when applying the wax to all painted, chrome and glass surfaces. Wiping it off is Just as Easy! 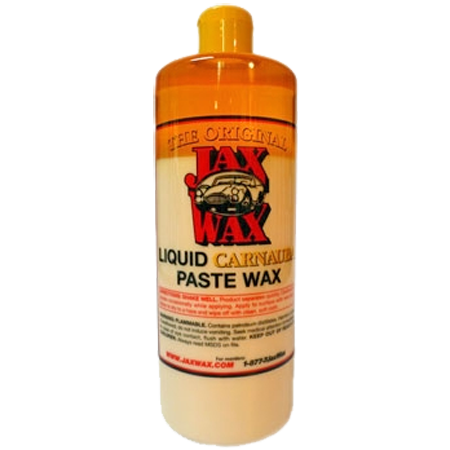 Jax Wax Liquid Carnauba Paste Wax will not Smear, Streak, Haze or be “Dusty” when removing it. 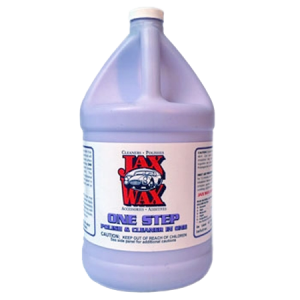 If you want to, you can apply Jax Wax Liquid Carnauba Paste Wax in the direct sunlight – even on black paint! We prefer to use a black or dark colored finish on a vehicle at shows. Right out in the direct sun on a hot surface. Black or dark colored painted finishes show everything! There is no better way to demonstrate how easy this wax is to use and the finish that it will create. If you can create an awesome “Black” finish without any streaks, hazing, smears or dust – you can replicate that on virtually any other finish hands down. You can even leave the wax on a surface for hours, an afternoon, a day or months – and it still wipes off with ease. Perfect for waxing right in the pits at the track! We have many customers that will wax their classic car or race car before they put it up for the winter, put a cover on it and remove the wax in the spring with the same results as if they put it on and took it right off. 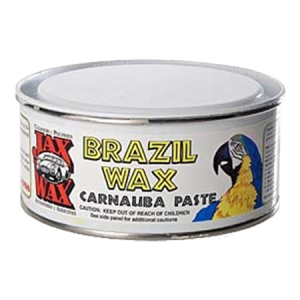 Jax Wax Liquid Carnauba Paste Wax is a “paste” wax in a liquid form, so it has the DURABILITY usually only found in traditional paste waxes. Whether your vehicle is a driver, or a classic car worth thousands – Jax Wax Liquid Carnauba Paste Wax can make a novice look like a pro. Thin is In! Think of it like painting a wall – a couple of thin even applications of wax is better. Don't apply wax like most people that use laundry detergent and think more is better. You not are adding anymore protection, durability or shine by using more wax. By applying the wax thin, you also avoid caking it in the body seams and are not wasting precious product. For example, waxing a 1963 Corvette Split Window Coupe will use just over 2 ounces of product. No need to use circular wiping motions! Just wipe it on in straight lines, slightly overlapping each time. From our experience, a good Wax Applicator makes all the difference in applying the product in thin even layers, is inexpensive and is worth it's weight in gold! The product works similar to rain repellent. It will not streak on the windshield with the wipers on, even at night. In fact, you won;t have to use your wipers as much and the water will be right off. In fact a lot of racers wax the inside of their windshields and helmet shields to help prevent them from fogging. 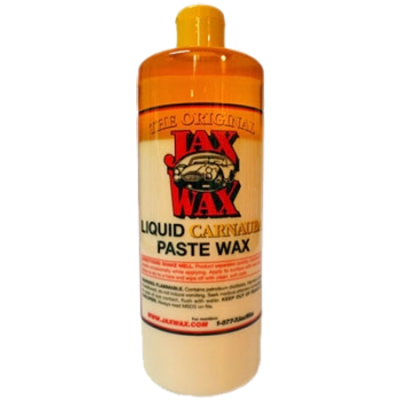 Be the first to review “Jax Wax Liquid Carnauba Paste Wax” Click here to cancel reply.